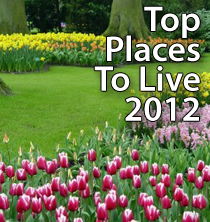 CNNMoney has released its Best Places To Live 2012 list. The annual survey is based on data from Onboard Informatics. Using Quality of Life factors such as education, crime and “town spirit”, and focusing on towns with between 50,000 and 300,000 residents, this year’s survey ranks the country’s best mid-sozed cities. To be eligible for ranking, towns mus have a median household income greater than 85 percent, and less than 200 percent, of the state median income; must not be a categorized as a “retirement community” or a town with “major job loss”; and must be racially-diverse. From a list of 744 eligible towns nationwide, Carmel, Indiana ranked first. In addition to ranking its Top 10 Best Places To Live, CNNMoney also offers a host of data on the top-ranked 100 cities at its website. See whether your hometown ranks, and what the data says about your town. As you review the rankings, however, remember that while lists like these can be helpful to a home buyer in Scottsdale , all “Best Place To Live”-like surveys are subjective. A bottom-ranked town may have no less appeal to you as an individual than a top-ranked one. Every city has something to offer to its residents. Therefore, before making a decision to buy a home, make sure to connect with a real estate agent with local market knowledge. That’s the best, most reliable way to make sure you’re getting the data on the market that matters most to you.